The Little Molalla tour offers beginners a chance to enjoy both small-town Oregon and rural scenery on quiet secondary roads. On the outskirts of town the route takes riders through the outstanding Ivor Davies Nature Trail and then past Rosse Posse Acres, a working elk farm that includes a petting zoo and a bed-and-breakfast. Once out of town, enjoy the panoramic views of rolling farmland surrounding Molalla. There are several small climbs involved. Start/End Point: Molalla Public Library, 201 E. 5th Street, Molalla. 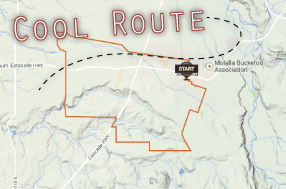 This route comes to us courtesy of Ride Oregon, Travel Oregon’s subsidiary website devoted to cataloging great rides.